These past few months I’ve been working on my graduation project for the Master of Animation at St Joost. What exactly is my story that’s worth sharing with the world? It’s been quite a challenge since I’m so used to working for clients with Explanimates and Vier. However after some good old fashioned research with lot’s of ups and downs I finally managed to pinpoint a story: Life’s a Game! If you’re interested: please read on! Many people get used to living their lives in a certain way. It’s easy to stay put and live your daily live. Maybe you’ve set out a course at one point in your life and you’re right on track. Or maybe you just took the opportunities that came your way. Either way, I think it’s vital to reflect on your course every once in a while. Stop and think: what am I doing and why? You’ve probably changed a little or a lot since you first made these goals and so has your environment. At this moment I’m at one of those crossroads in my life, just like many of my thirty year old friends. Should I build a career, start a family or go on an adventure? These choices were also made by my parents (in law) and still come up every now and then. I love to see what some of their choices have brought: stability, self-development, status, or freedom. However, at this moment, when I’m faced with these choices, I can hardly imagine the consequences. Which effects will they have in the long run? And is one choice really superior to the other options? Even though you cannot possibly know the effect of the unmade choices, you still might wonder “what if”. Test 1: I used scanned materials that I cut out and animated in After Effects. In this society we’re expected to make many choices every day. This comes from the idea that everyone is responsible for his or her own success. By making the right choices you can shape and ‘nurture’ your own future. However I believe success is not so much a choice but an accumulation of random events and ‘nature’. So much depends on your background, culture, environment and opportunities. Being a good student for example has a lot to do with your genetic and cultural circumstances: are your parents highly educated? Or does your family have the financial freedom to give you the best education possible? Nevertheless every choice we make influences our possible future path. Therefore, every choice we have matters. However, what we choose might be of less importance. Every choice brings us forward in oneway or another. Even ‘wrong’ choices teach us something. Either way, every choice sets us in motion and shapes who we are. I think what’s most important is to stop and think, reevaluate your choices and don’t be afraid to change your course. What sets you in motion? Are you good where you are right now or is it time to change your course? Test 2: I wanted to add a bit more personality and life to the character, so I made this test in TvPaint. Since this is such a universal subject I’d like to visualize it in a symbolic and essential way. Communication is all about making a connection with others; therefore I want to find an essential form that most people will be able to understand. I’d like to use abstract shapes, lines and symbols to create an obstacle course, much like a game or Rube Goldberg machine. Every step that’s taken sets the next stage in motion like a domino effect. I will focus on the period between starting one’s life until the moment they will give life themselves; from zero to thirty years old. This is basically my life, as I’ve known it up until now, just before a major change. Another reason for choosing this segment is my fascination with the loop or the never-ending story of life. 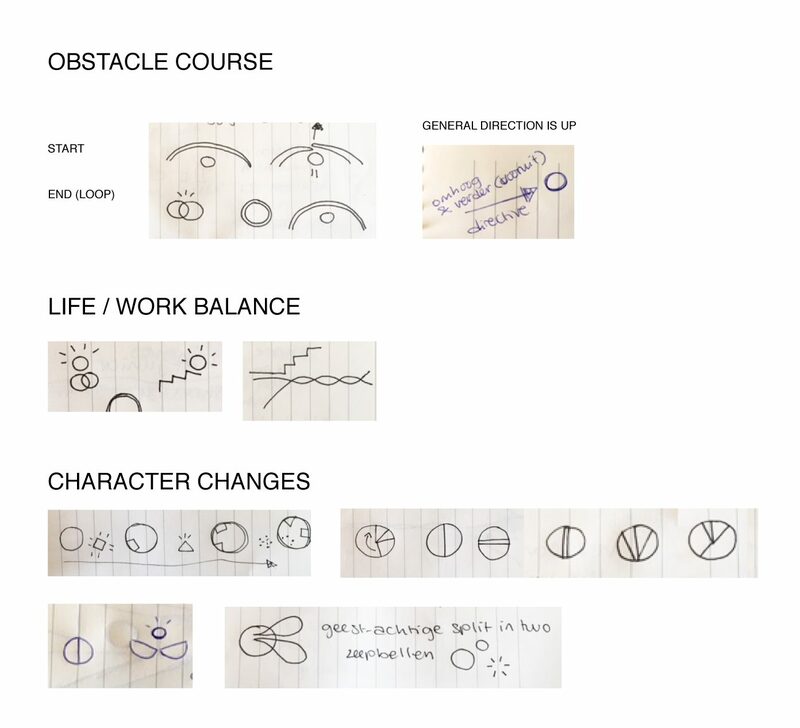 During the obstacle course a simple character, in the shape of a circle, will face several choices in the form of obstacles. These choices will physically change the way the character looks in color, shape and texture. An overview of my sketches so far. The first part of the course, namely childhood, will be one big roller coaster of domino effects since we don’t really have a choice yet at this point. Choices are made by the obstacle course itself that physically affects the character’s appearance. Until the moment comes where the character has to make its own choices. These choices will mainly revolve around the work life balance. There will be several situations in which the character has to determine what path to follow. Different obstacles and game elements will show the balancing act that plays a big part in these choices. If the character chooses one option, the other option will be influenced in a positive or negative way as well. For example a scale that weighs heavier on one side. However, some changes will happen along the way regardless of the characters actions, like a trapdoor opening up or the introduction of a new character along the way. This shows the randomness we’re faced with in everyday live. The choices during the course will be visualized using recognizable game elements, like the trapdoor and the scale, to leave room for interpretation and thought. The story ends with the character meeting a life partner along the way and eventually creating life. The two circles slide together and form many new circles (or cells). One of these new circles pops out and starts the game all over again. I hope this abstract game of life gets people to think about their own lives. What choices have you made that influence your life today? And more importantly what sets your life in motion? 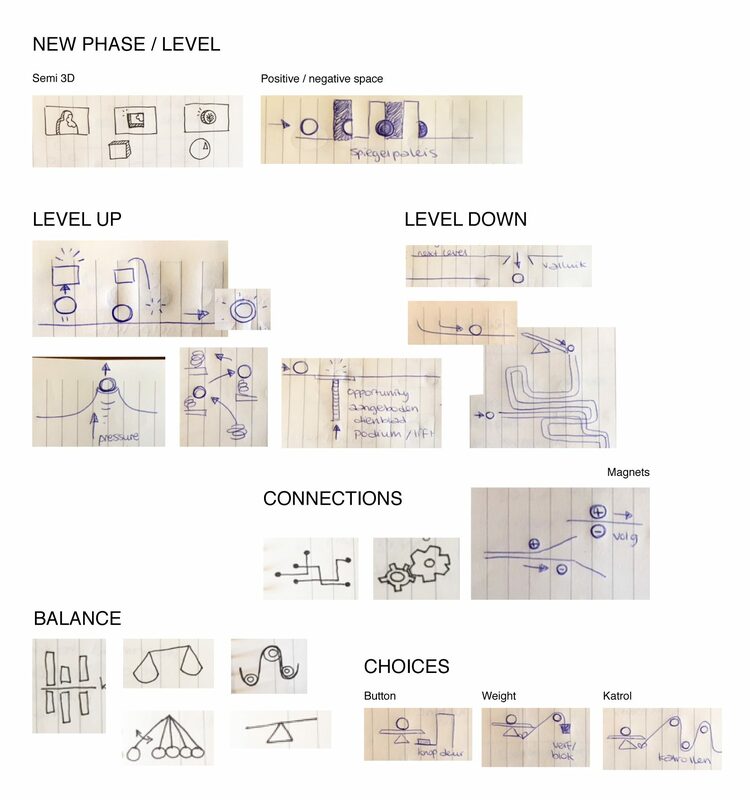 Sketches of different game elements I have in mind for the obstacle course.